Eleven years ago the film Idiocracy was released. I have only seen portions. I am not a great fan of the comedy of errors. It is difficult for me to watch Seinfeld because of the George Costanza character. Jason Alexander did a brilliant job in making Costanza almost utterly disagreeable. Nevertheless, evidence seems to be mounting that Idiocracy was prophetic and that perhaps I should make myself watch it. Apparently it has not taken 5 centuries for the Idiocrats to assume power. I call the grammar and writing column “Grammar Guerrilla” in part because guerrilla (or guerilla) is a homonym for gorilla (i.e., they sound similar when pronounced) but the two words, obviously signify very different things. A grammar gorilla would be a silly thing indeed. A grammar guerilla, however, could be a very useful thing indeed. 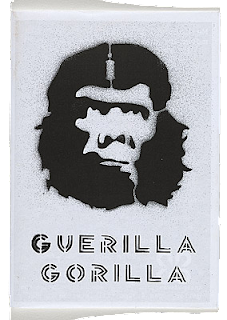 A guerilla is an irregular (not in a standing army) paramilitary resistance fighter: The Heidelblog is conducting a guerrilla war against bad theology, bad history, and bad grammar. A gorilla, however, is a great ape: The gorilla exhibit at the Wild Animal Park is one of my favorites. I did not expect that I would have to explain the difference but apparently I was wrong.